Cutrine Plus Granular Label covers application methods, rates and aquatic weeds and algae controlled by Cutrine granular based algaecide. Contains 2.2 lbs. of elemental copper per 60 lbs. CUTRINE-PLUS GRANULAR ALGAECIDE is effective in controlling a broad range of benthic (bottom-growing) algae including: Chara, Nitella and filamentous forms. CUTRINE-PLUS GRANULAR ALGAECIDE is also effective in controlling the rooted aquatic plant, Hydrilla verticillata. The ethanolamines in CUTRINE-PLUS GRANULAR ALGAECIDE prevent the precipitation of copper with carbonates and bicarbonates in the water. Waters treated with CUTRINE-PLUS GRANULAR ALGAECIDE may be used for swimming, fishing, drinking water treatment, livestock watering or irrigating turf, ornamental plants or crops following treatment. It is a violation of Federal Law to use this product in a manner inconsistent with its labeling. Read entire label and use strictly in accordance with precautionary statements and directions. For applications in waters destined for use as drinking water, those must receive additional and separate potable water treatment. Do not apply more than 1.0 ppm as metallic copper in these waters. Do not apply this product in a way that will contact workers or other persons, either directly or through drift. Only protected handlers may be in the area during application. For requirements specific to your State or Tribe, consult the State or Tribal agency responsible for pesticide regulation. Do not enter or allow others to enter until application of product has been completed. 1. Identify form(s) of targeted bottom-growing algae (Chara / Nitella or Filamentous) or Hydrilla. 2. Estimate the height of targeted plant growth (in ft.) in the water column. This would be the distance from bottom to top of plants. 4. Refer to Table 1 to determine lbs. 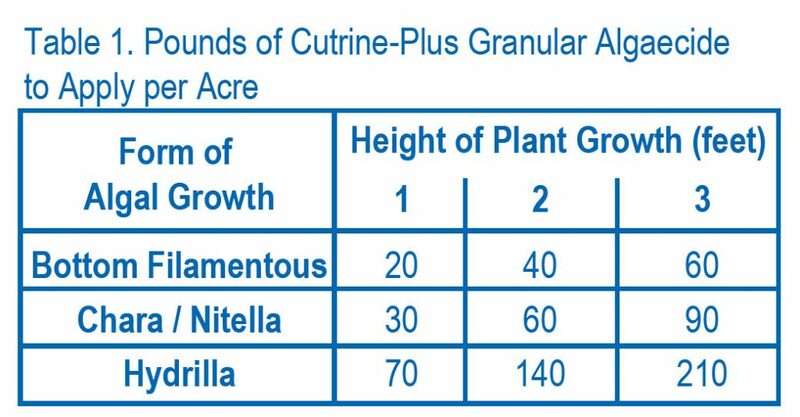 of CUTRINE-PLUS GRANULAR ALGAECIDE to apply per surface acre based upon type and height of targeted growth. 5. Distribute CUTRINE-PLUS GRANULAR ALGAECIDE evenly over the water surface directly over the targeted vegetation, varying rates with the height of the vegetation in the water column. A dry fertilizer spreader may be used to ensure even distribution. For treatment around small areas such as docks, rafts, water intakes, etc., apply product uniformly at the rate of 1.5 pounds (24 oz.) per 1,000 square feet. (In areas less than 1 ft. deep, reduce dosage by 2 oz. per inch of water per 1,000 sq. ft. so as to not exceed 1.0 ppm copper). • Apply CUTRINE-PLUS GRANULAR ALGAECIDE before growth has reached the surface and begun to form mats or canopies. If this has already occurred, application of Cutrine-Plus liquid is recommended. • Calm and sunny conditions when water temperature is at least 60ºF will usually expedite control results. • Visible reduction in algae growth should be observed in 24 to 48 hours following application with full effects of treatments (bleaching and breaking apart of plant material) sometimes taking 7 – 10 days depending upon algae forms, weather, degree of infestation and water temperatures. • Re-treat areas if re-growth begins to appear and seasonal control is desired. • Apply treatment along the shore and proceed outwards in bands to allow fish to move into untreated areas. No more than ½ of the water body may be treated at one time (Refer to Environmental Hazards for additional guidance). The minimum retreatment interval between consecutive treatments is 14 days. DANGER. Corrosive. Causes irreversible eye damage and skin burns. May be fatal if absorbed through the skin. Harmful if swallowed or inhaled. Do not get in eyes, on skin, or on clothing. Avoid breathing dust. Mixers, loaders, applicators, and other handlers must wear the following: coveralls over long sleeved shirt and long pants, protective eyewear (goggles, face shield), chemical resistant footwear, socks, and chemical resistant gloves. When mixing and loading wear a chemical resistant apron. For overhead exposure wear chemical resistant headgear. When cleaning equipment, wear a chemical resistant apron. Users must wash hands before eating, drinking, chewing gum, using tobacco or using the toilet. Users must remove clothing/PPE immediately if pesticide gets inside. Then wash thoroughly and put on clean clothing. Users must remove PPE immediately after handling this product. As soon as possible, wash thoroughly and change into clean clothing. Wash outside of gloves before removing. This pesticide is toxic to fish and aquatic invertebrates. Waters treated with this product may be hazardous to aquatic organisms. Treatment of aquatic weeds and algae can result in oxygen loss from decomposition of dead algae and weeds. This oxygen loss can cause fish and invertebrate suffocation. To minimize this hazard, do not treat more than ½ of the water body to avoid depletion of oxygen due to decaying vegetation. Wait at least 14 days between treatments. Begin treatment along the shore and proceed outwards in bands to allow fish to move into untreated areas. Consult with the State or local agency with primary responsibility for regulating pesticides before applying to public waters to determine if a permit is required. This product may be toxic to trout and other species of fish. Fish toxicity is dependent upon the hardness of water. Do use in water containing trout if the carbonate hardness of the water does not exceed 50ppm. Do not use in waters containing Koi and hybrid goldfish. Not intended for use in small volume, garden pond systems. Certain water conditions including low pH (?6.5), low dissolved organic carbon (DOC) levels (3.0 mg/L or lower), and “soft” waters (i.e. alkalinity less than 50 mg/L), increases the potential acute toxicity to non-target aquatic organisms. PESTICIDE STORAGE: Keep container closed when not in use. Keep pesticide in original container. Do not put concentrate or dilute into food or drink containers. Do not reuse or refill container. Do not contaminate feed, feedstuffs, or drinking water. Do not store or transport near feed or food. PESTICIDE DISPOSAL: Pesticide wastes are acutely hazardous. Open dumping is prohibited. Improper disposal of excess pesticide, spray mixture, or rinsate is a violation of Federal Law. If these wastes cannot be disposed of by use according to label instructions, contact your State Pesticide or Environmental Control Agency, or the Hazardous Waste representative at the nearest EPA Regional Office for guidance. CONTAINER DISPOSAL: Nonrefillable container. Do not reuse container. Triple rinse as follows: Empty the remaining contents into application equipment or a mix tank. Fill the container ¼ full with water and recap. Shake for 10 seconds. Pour rinsate into application equipment or a mix tank or store rinsate for later use or disposal. Drain for 10 seconds after the flow begins to drip. Repeat this procedure two more times. Then offer for recycling or reconditioning if available or puncture and dispose of in approved landfill, or incineration, or, if allowed by state and local authorities, by burning. If burned, stay out of smoke. Consult Federal, State or local authorities for approved alternative procedures. CONTAINER DISPOSAL: Nonrefillable container. Do not reuse or refill this container. Completely empty bag into application equipment by shaking and tapping sides and bottom to loosen clinging particles. If not emptied in this manner, the bag may be considered an acute hazardous waste and must be disposed in accordance with local, state and federal regulations. When completely empty, offer for recycling if available, or dispose of bag in a sanitary landfill or by incineration, or, if allowed by state and local authorities, by burning. If burned, stay out of smoke. To the extent consistent with applicable law neither the manufacturer nor the seller makes any warranty, expressed or implied concerning the use of this product other than indicated on the label. To the extent consistent with applicable law buyer assumes risk of use of this material when such use is contrary to label instructions. Read and follow the label directions. Cutrine is a registered trademark of Arch Chemicals, Inc. If inhaled: Move person to fresh air. If person is not breathing, call 911 or an ambulance, then give artificial respiration, preferably mouth-to- mouth if possible. Call a poison control center or doctor for further treatment advice. Have the product container or label with you when calling a poison control center or doctor, or going for treatment. For help with a spill, leak, fire or exposure involving this product call CHEMTREC 1-800-424-9300. IN CASE OF EMERGENCY CALL: 1-800-654-6911.